The community of Albion has had its struggles over the past 20 years. While many people choose to dwell on the past during a recent conversation between key leaders in the community “Albion Run” was launched as a three event per year 5k/10/Fun Run/Walk to bring the community together through healthy activity, while raising money for organizations within the community. The plan was immediately implemented, with the hiring of “Three Disciplines” a professional race management team in Michigan. The group then added to the uniqueness by naming each of the three events with a different subtitle. The first event, which took place on May 5, was titled “Run the Rock” to highlight the Albion College campus. The second event scheduled for September 14th is titled the “History Hustle” to focus on the rich history of Albion. The third will be the Albion 5K that will be part of the annual Festival of the Forks celebration that focuses on the forks of the Kalamazoo River where the original settlers of Albion set up camp. The inaugural event was a great success under sunny skies as the runners gathered in the new athletic facilities at Albion College on a Friday afternoon. All the volunteers for the event were recruited by the Forks Senior Center. Luann Sommers state “we were excited to be the benefactors of this event and our volunteers had a great time supporting the runners/walkers”. 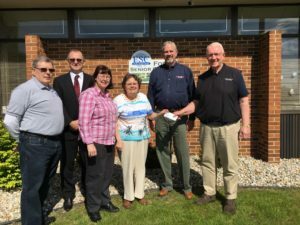 Bill stated “it was exciting to turn over 600 dollars to the Forks Senior Center for their support of this successful event”. At the end of the day, there are great people making great things happen in Albion. See you in July! !